Vedolizumab (proposed trade name Entyvio), was developed as a treatment for patients with moderate to severe ulcerative colitis (UC) or Crohn's disease (CD), who have failed at least one conventional therapy, including tumor necrosis factor (TNF) antagonists. 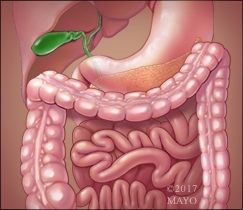 Dr. Edward Loftus, M.D., reviews a recent study published in the journal Gut, in which researchers reported on the safety profile of vedolizumab. Vedolizumab is a monoclonal antibody that selectively prevents the infiltration of leucocytes into the gastrointestinal submucosa. The efficacy and safety of vedolizumab in adults with IBD have been demonstrated in several clinical trials with follow-up to 1 year. Treatment with vedolizumab for up to 5 years in a population of over 2800 patients demonstrated a favourable safety profile. Vedolizumab is not associated with an increased risk of serious or opportunistic infections, and the rate of malignancy (0.1/100 person-years) is consistent with that observed in patients with IBD normally. Although a favourable benefit-risk profile makes vedolizumab a useful option for the long-term treatment of IBD, researchers still need to better understand and observe how its safety profile evolves over time. Read the full study online here.